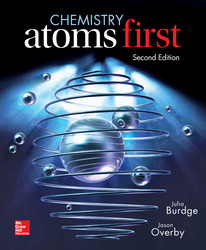 The Atoms First approach provides a consistent and logical method for teaching general chemistry. This approach starts with the fundamental building block of matter, the atom, and uses it as the stepping stone to understanding more complex chemistry topics. Once mastery of the nature of atoms and electrons is achieved, the formation and properties of compounds are developed. Only after the study of matter and the atom will students have sufficient background to fully engage in topics such as stoichiometry, kinetics, equilibrium, and thermodynamics. Thus, the Atoms First method empowers instructors to present the most complete and compelling story of general chemistry. Far from a simple re-ordering of topics, this is a book that will truly meet the needs of the growing atoms-first market. The thermochemistry/thermodynamics coverage has been redesigned with a truly logical, atoms-first approach. The 2E table of contents keeps thermochemistry in its original position at Chapter 10, maintaining the logical narrative flow of stoichiometry (Chapter 8) and solution chemistry (Chapter 9), and places thermodynamics at Chapter 14, ahead of both kinetics and equilibrium coverage. The placement of thermodynamics in Chapter 14 provides the ideal prelude to chemical equilibrium (Chapters 15-17) and Electrochemistry (Chapter 18). Chemical equilibrium is introduced as a phenomenon driven by thermodynamics. The placement of thermodynamics in chapter 14 also allows for alignment with the ACS exam, as a second-semester topic. Intermolecular forces are introduced earlier in the second edition, in chapter 7 (rather than in chapter 12 from the 1E). Practice Problem “C” added to the consistent problem-solving skill development. Burdge/Overby fosters a consistent problem-solving approach providing the skill set for students to master the basics of critical thinking. Each Worked Example is followed by three practice problems. Practice Problem “A” allows the student to solve the problem using the same steps in the Sample Problem above. Practice Problem “B” probes comprehension of the same concept as Practice Problem “A”, but is generally sufficiently different that it cannot be solved using the exact approach that is used in the Worked Example. Practice Problem “C” probes the student's conceptual understanding of the material. A description of each Key Equation helps students identify and understand the purpose of each equation, including how to apply it and when it is appropriate to do so. Engaging real-life examples and applications. Each chapter is introduced with an engaging photo and short interesting, relevant explanation of the photo to interest the student. Applications titled "Thinking Outside the Box" are available in every chapter and contain a topic that is applicable to the chapter but not necessarily covered in the course. If the instructor wants the students to read these, there are end-of-chapter problems that can be assigned. Outstanding pedagogy for student learning. The Section Reviews (many with visuals), Rewind and Fast Forward Buttons are meant to enhance student understanding and comprehension by reinforcing current concepts and interconnecting new concepts to others throughout the text. Atoms First offers an exciting visual program of both unique and conventional art figures that enhance student understanding of chemical concepts. The art includes Visualizing Chemistry process pieces, macro-micro art, and three-dimensional art. The art breaks down the chemical processes from complex into simpler, more user-friendly concepts. You will find 18 Visualizing Process Piece art-spreads that emphasize the fundamental, vitally important principles of chemistry. McGraw-Hill's CONNECT: With Connect Chemistry, instructors can deliver assignments, quizzes, and tests online. The problems directly from the end-of-chapter material in the textbook are presented in an auto-gradable format. The online homework system incorporates new and exciting and interactive tools including the market standard drawing tool - ChemDraw. Julia Burdge and Jason Overby's problem-solving methodology is carried over from the textbook into the online homework system. Over 2,200 end-of-chapter problems and additional problems are available to assign within the Connect program. Instructors can edit existing questions and write entirely new problems; track individual student performance – by question, assignment, concept, or in relation to the class overall – with automatic grading; provide instant feedback to students; and secure storage of detailed grade reports online. Jason Overby received his B.S. in chemistry and political science from the University of Tennessee at Martin, his Ph.D. in inorganic chemistry from Vanderbilt University, and conducted postdoctoral research at Dartmouth College. Since joining the Department of Chemistry and Biochemistry at the College of Charleston, Jason has taught courses from general chemistry to advanced inorganic chemistry, and conducts research with undergraduates. He is interested in integrating technology into the classroom, with a particular focus on adaptive learning.